I’ve temporarily taken over S-WC’s spot this week as I want to draw your attention to what has a very strong chance of finishing 2014 as my favourite LP of the year. 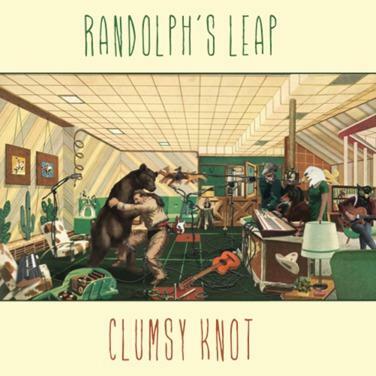 Officially released yesterday, but launched at a gig last Saturday evening at a venue about a mile from Villain Towers, Clumsy Knot is the ‘proper’ debut LP by Randolph’s Leap. It has come out on a relatively new label, Lost Map, which is run by Johnny Lynch, (aka The Pictish Trail) a name which will be very familiar to fans of Fence Records, a venture which he was a huge part of until late 2013. I was lucky enough to have been passed on an advance copy of Clumsy Knot about three weeks ago and it has been on heavy rotation ever since. While I’ve been well aware of the band for a while, not least for the fact that some of the best and most knowledgable Scottish music bloggers out there (and in particular Mike from Manic Pop Thrills and Lloyd from Peenko) have been raving about them, this was the first I had really sat down and given the music my close attention. There are 13 tracks on the LP. Some of them are re-workings of songs previously available on a range of low-key and lo-fi recordings these past couple of years. Now I’m in the fortunate position of not having to compare the merits of the earlier home-made versions against what has now been released and so I’m coming to Clumsy Knot without any pre-conceived ideas. And I’m prepared to say that it is an exceedingly fine record with loads of moments that thrilled me in ways that are all too rare nowadays when I’m listening to new and emerging bands for the first time. 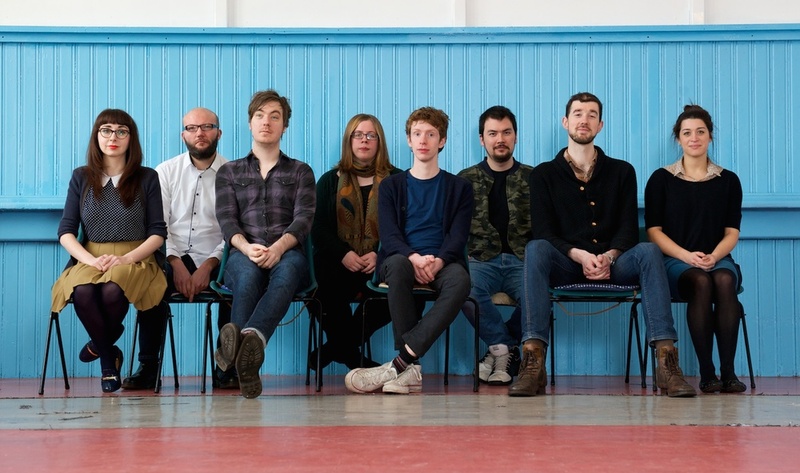 There are loads of bands out there, particularly here in Scotland, who are incredibly adept at blending folk, indie and pop in ways that are hugely enjoyable. But Randolph’s Leap have raised that particular bar just a bit higher. It’s an album on which the talents of all eight performers can be appreciated, especially on the big-sounding, uptempo and impossible not to dance-to songs such as past single Hermit where the keyboards, violin, trumpet and trombone invoke marvellous memories of Dexy’s at the height of their powers but with lyrics that invoke the gentle humour and playfulness of Neil Hannon. On the other side of the coin, there’s a song like Weatherman, a gut-wrenching break-up song laced with a couple of wry and amusingly bitter one-liners, while Black & Blue is one which musically got me thinking about some of the acoustic material written back in the early years by Martin Stephenson. And thinking about it further – just as Boat to Bolivia veered all over the place some thirty years ago in a way that has made it one of my favourite albums of all time, then Clumsy Knot is a record impossible to pigeon-hole given the wide range of styles employed throughout. I think it’s also worth mentioning that, on the first couple of listens, I was also struck by a similarity that some of the songs had in sound to material written and recorded by Paulo Nutini. This observation was and remains based admittedly on a limited knowledge of the Paisley troubadours material, but given how his catchy and radio-friendly songs have earned him millions of pounds while keeping on the right side of the critics, then there’s surely enough room and interest to put the band and this new label firmly on the map. However, my praise for this particular record and the band is not simply down to a few weeks on the i-pod. Readers of old will know that the music snob in me holds back from giving out fulsome praise until I’ve had the chance to see if the singer or band in question can cut the mustard in a live setting, and up until last Saturday, I had only seen Randolph’s Leap-lite – i.e either frontman Adam Ross on his own or with just some of his bandmates and never as the main attraction. This time it was the full thing, and despite being handicapped by a venue that was less than ideal for sound (it’s part of 100-year old former school building with a lot of echo) as well as what seemed like a bit of an below-par PA, Randolph’s Leap turned in a mesmerising, energetic and captivating performance, roared on by 250-strong audience delighted to be part of what was such a special occasion. My roars were as loud as those who have been following the band from the beginning. It was a gig I went home from with a big daft grin on my face. One that stayed with me all of Sunday as I went through to watch my football team compete in a cup final for the first time in 20 years. The daft grin just got wider as I watched my team defy the odds and pull off what many regarded as a shock win. Today, I went back to work and again played the album one more time. The gig and the football match are now intertwined events in my mind and always will be. Forget the ‘strong chance’ I gave Clumsy Knot for album of the year. It’s a shoo-in…………. Clumsy Knot is available to buy here. It can also, for a short time, be listened to here. On track four of the stream as I type and reckon I’ll be buying a copy in the very near future.